This veteran hard rock band from Sweden is firmly in their “vintage heavy rock” phase, something they started with their previous release (War of Kings). I’m sure it helps that producer Dave Cobb has been sitting in the studio for both War of Kings and Walk the Earth and gets a co-writer credit on 9 of the 10 tracks here. Cobb has worked with Rival Sons and All Them Witches, both of which are bands that have a 1970s heavy rock influence. It’s cool to see this band go from heavy metal to glam metal/AOR to now having a vintage 1970’s bluesy hard rock sound. Just like War of Kings, there’s plenty here for fans of Deep Purple (who they are touring with to support this album), Led Zeppelin, etc. If you didn’t know this was Europe, you’d think you really were listening to a new Deep Purple album at times. Joey Tempest sounds like Ian Gillan at times. The song “GTO” is total Deep Purple worship and the band fully admits they had Deep Purple in mind when they wrote it. You won’t find anything that sounds even remotely like “Cherokee”, “Rock the Night Away” or “Ninja” on this release, but the band did write what they claim to be a sequel (in terms of lyrics) to “The Final Countdown” in the form of “Pictures”, a beautiful melancholy ballad. “Kingdom United” might be my favorite song of the year by any band, but “Walk the Earth” and “The Siege” are great epic rockers as well. As much as I liked War of Kings, with Walk the Earth I’ve found myself spinning it way more times than the band’s previous effort. Walk the Earth is full of powerful, timeless hard rock songs. Songs so good that it’s almost a shame because you know it’ll never get the respect or airplay that it deserves. Europe has no right to be this good, this legit, this authentic nearly 40 years into their career, but they are and it’s amazing. Wow. 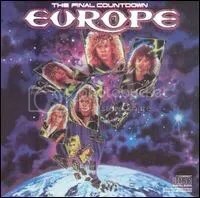 Although I’m not extremely well-versed in Europe’s discography, I knew that they were heavier in their earlier years before they hit it big with “The Final Countdown”. They are a band I haven’t followed all that closely. A new album would come out, I’d give a few songs a spin online, wouldn’t be too impressed, and would move on. Well, I didn’t do that with War of Kings. I went in expecting more of the same of what they’d recently been doing. I wasn’t expecting such a 1970s heavy and sometimes bluesy rock influence. Deep Purple, Led Zeppelin, and Black Sabbath vibes are all over this album. This are the type of songs that the ill-fated Black Country Communion wishes they wrote. In fact, Joey Tempest cited Zep, Purple & Sabbath as the bands Europe had in mind when recording this album. He even went on to say that War of the Kings is the album the band has always wanted to make going back to their childhood when they grew up listening to those aforementioned groups. Helping to make the vintage sound even more apparent is producer Dave Cobb who has worked with modern vintage rock band Rival Sons. This is definitely an album worth checking out for anyone who is a fan of classic rock and metal from the 1970s. It’s riff heavy and the keyboards are used perfectly to give that Purple-esque feel on songs like “Days of Rock N Roll” while “Rainbow Bridge” has a middle eastern element and rhythm that would sound at home in a Led Zeppelin song. This is NOT the type of album I would have expected to hear from Europe, but it’s great that I am. Just about anyone who has been to a sporting event is familiar with “The Final Countdown”. And that may have been humorous the first few times it was played, that song is over 20 years old and it’s time to stop. It’s not cute anymore. Anyway, the song is gloriously cheesy as is the rest of this pop-metal masterpiece. “Carrie” was a big hit ballad for the band, and it’s a great one, but songs like “Rock the Night” and “Cherokee” have proven to me this band really has legs and can rock when they want to. It was actually thanks to The Boneyard channel on XM Radio that convinced me to buy this album because for a while, they kept playing both of those songs. The album is definitely cheesy all around, there’s just some albums that CANNOT be blasted on your car stereo with the windows down, but it’s a really fun pop-metal album.